. 9 Comments Tags: amazing, color, hdr, photography, photomatic, Photoshop, portraits, professional, wedidngs. ~ Check out Gavin’s 3 day HDR workshop coming Fall 2009. More details here. 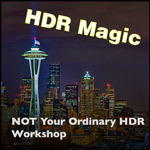 So you’ve probably heard about HDR photography, and you may be wondering what you can do with it and why it’s so cool. 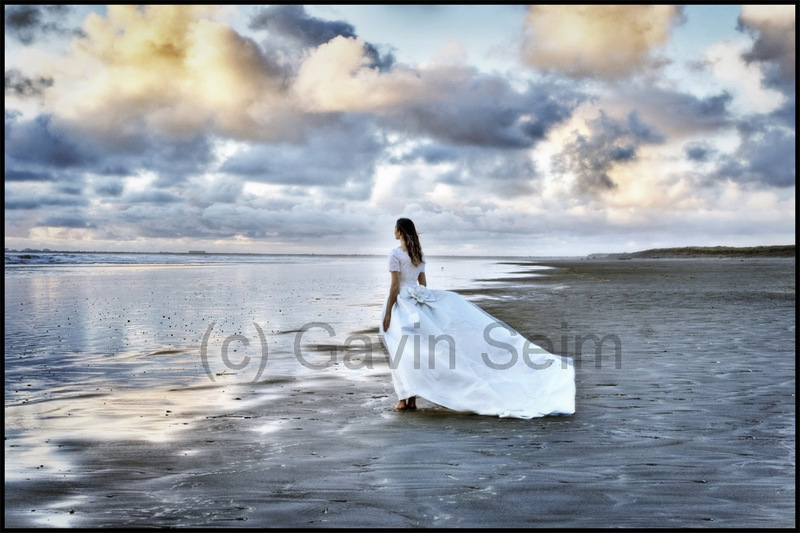 By Gavin Seim: This is not a short article but it will explain a lot about HDR photography and why its so amazing. 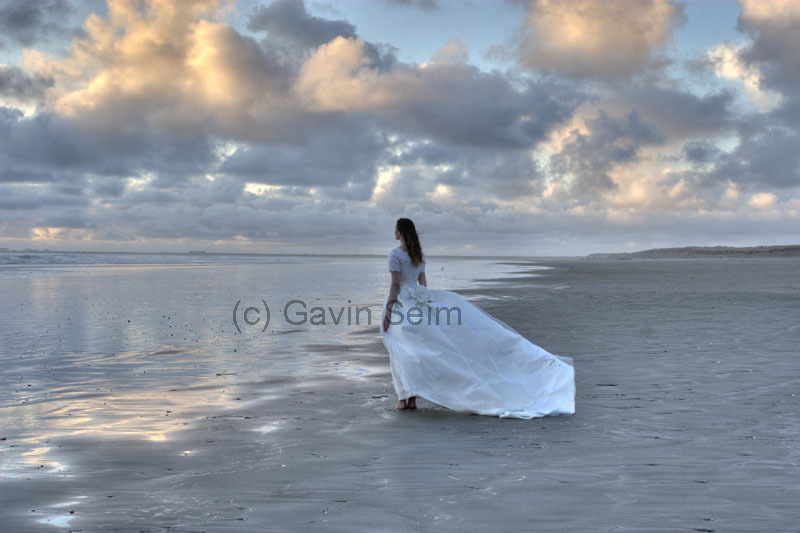 Today we’re going to talk about the editing techniques I used to create “Look To The Wind” the bride on the beach image that you probably have heard mentioned on Pro Photo Show, and maybe seen on the net. Also below are some additional links for things relevant to HDR. Read the HDR Portraits main tutorial. HDR is a method of taking multiple images and combining them in a high dynamic range file. Lets say you take three images of the exact same scene, at various exposure levels. Standard images are only around 8 bits each, basically meaning that their ability to correctly expose dark scenes while keeping bright scenes from getting overexposed is limited. So to make an HDR you might take one image that’s underexposed, one image over, and one with correct exposure. Then using software you can combine the shadow and highlight details from all the images into a single image is called an HDR, It’s the combined bits of these images, and is usually a 32 bit image when converted. What does 32bit mean to you? It means it can contain far more light. Even though the actual resolution of the image is not increased the details inside it are much higher. The HDR Photography technique is most often done with nature or still life images, but I have been doing extensive experimenting with this technique in portraits as well with good results, as we’ll see today. So lets look at an example. In this image I took three shots of the bride on the beach using continuous shooting mode with auto exposure bracketing. This along with a model holding as still as possible, and a fairly wide angle scene made “Look To The Wind” Possible possible (click for a larger version) You can read more about HDR portrait techniques in my HDR portrait article. 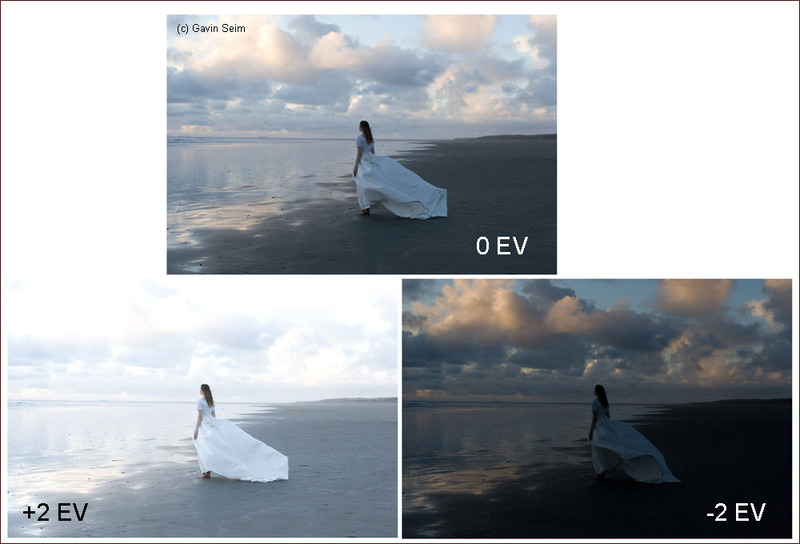 There a a few ways to take the three images and make an HDR from them. First take your images in unedited raw form. You could do it with jpegs, but raw will give you the best results. Don’t correct the raw files before converting to HDR. 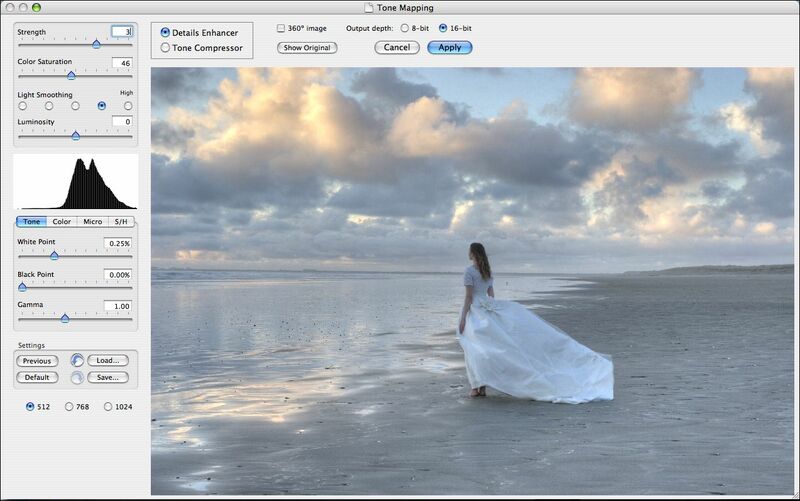 There is a very basic tool in Photoshop for converting the images called Merge To HDR (File/Automate/Merge To HDR) This allows you to select you images, and it will combine them into and 32 bit image. You then can use tools to adjust the levels, and curves of the image mix to try and get a good result. A better method is a tool called Photomatix that converts the raw images and gives you far better tools for correcting them. It also allows for batches. The key to a good HDR that is often messed up is correcting it wrong. Just because you have the 32 bit image doesn’t mean it’s instantly a masterpiece. Proper correction takes a little practice, but it’s key to a great image. 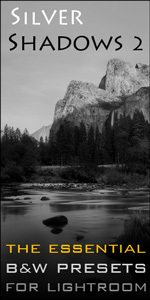 For this reason it’s better to use a program like Photomatix, as there are far more options. You can use Photoshop Merge to HDR but the critical settings are not as good for HDR, and you’ll be stuck trying to get things corrected using only curves levels ect. One VERY Important adjustment that Photoshop lacks is called “Light Smoothing” and it allows you to control the balance of shadows and highlights. Here is a screenshot from photomatix of our converted HDR image before final corrections. It looks fair but is a bit washed out. The beauty is that because we now have that 32 bit dynamic we can bring out the details as needed. Once I play with the settings and get things looking pretty good I save the image out as a 16 bit tiff. Though the image may look pretty cool, chances are it still needs some more work. Even though we’ve brought out the exposure in most desired areas we still need to bring out the look and feel we want in our image. This is where I take it back to Photoshop and finish the magic. Since we’ve brought out the exposure details we need we don’t have to have it at 32 bit anymore, but I’ll usually try to keep it at 16 until I bring out the last details needed. I also save the various versions along the way in case I need to go back. So where are we now?. The three images have been combined in photomatix, and we’ve corrected the details as best we can here and saved them out as a 16 bit tiff image. Below is what it looks like at this point. We see that though there are some great details the image still lacks snap. It looks too flat and washed out. So now it’s time to go back into our image editor and work on those details. This usually involves adjusting brightness, contrast, curves, levels, etc. Then I usually run Photoshop actions to get some amazing looking effects. My Hollywood Effects action set has some actions that work well on HDR images so you can check them out if you need some good effects too add pizazz. Below is the final result after manipulating all those HDR bits. Yes it looks like a whole different image than the one we had when we started, but this is how it was made. The key was correcting the dynamic range properly to start with (what we did in photomatix) then using proper exposure and contract corrections in photoshop. Finally the beauty was topped off with some burning and dodging, and actions that gave us a more punchy sharp look, and subtle glowing effect. So, some last questions and answers. Q. Why did we go to all the hassle to make this 32 but HDR, and eventually saved back to a jpeg which in only 8 bits again. A. 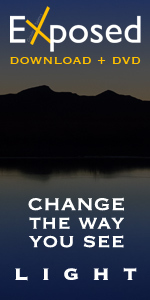 There is no other way to do it. By making the 32 bit image we were able to pull the details in that we wanted. After editing we could save it back out as a standard jpeg because we already took what we needed, and we need to go back to jpeg in the end for compatibility sake. Q. Why cant I just take a single image and save it a various explore levels then convert it to and HDR. A. You can, and some people do this but it;s not a true HDR. It may look cool but you will never have the detail that you can get by combining actual exposures because your taking an image and trying to pull something out that was not there in the first place. Q. Can I correct raw files before I convert to HDR, and make editing easier. A. Yes and no. Raw corrections are not saved directly in a file, but as add on data. The HDR conversion basically overlooks this and takes the plain to images to make the HDR. You could edit jpegs and use them to make your HDR, but using raw files to start with really is generally best. Q. Is it better to take more than three exposure when making an HDR photo. A. I usually only take thee exposures because it allows me to us auto exposure bracketing and take the shows fast in continues shooting mode. In still shots you can take more an sometimes it might give you a bit more range, but it’s not essential. For portraits to pretty much have to use that fast auto mode since a person can’t hold still very well. 2. correct the details on the image to make the balance of highlights, shadows, and contrast as good as possible. 3. 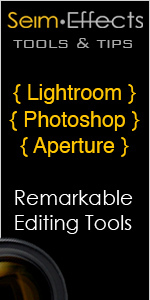 Take the image into Photshop (or other editor) and do the final correction like color tones, saturation, curves. contrast etc and then add final effect like glows.